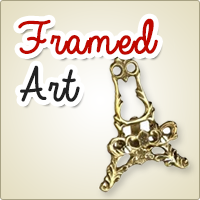 Blog › Information › Are you a fan of framed art...? Do you have the perfect piece of art which needs displaying? Perhaps you're looking for the best way to display your art in your home or office? We supply a few ways to display framed art. Our brass easel stands offering exquisite brass detail, are a popular choice to display either traditional or modern pieces. Our medium stand is currently in our sale....hurry whilst stocks last! Our metal postbox photo frame, a contemporary piece which is easy to hang, is art in itself. The picture surround is a classic British statement and is suitable for both indoor and outdoor use. Or perhaps your interested in our handmade brass bugle instead, a beautiful choice among brass fans. Although it cannot be framed, it is a decorative item, which can be played! Framing artwork in the right frame is crucial, as the right combination will make a great statement! You will want to show off your art/photos to the best standard, whilst matching the style or theme of a room, as discussed in the article above. Is there a frame you require which is not currently displayed on our Website? Please tell us below and we will get back to you!